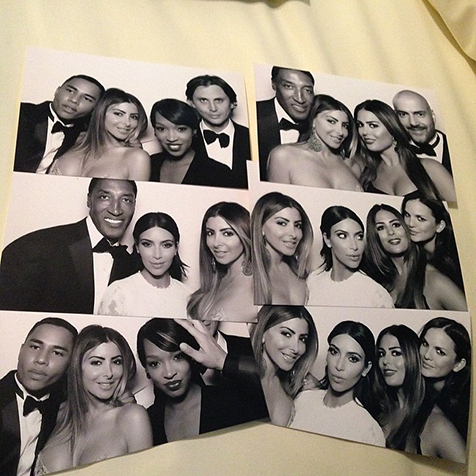 Krazy for Kim or Kanye? Or maybe you just loved the glamorous touches of their wedding? Here are a few ways you can have that luxe feel for less! 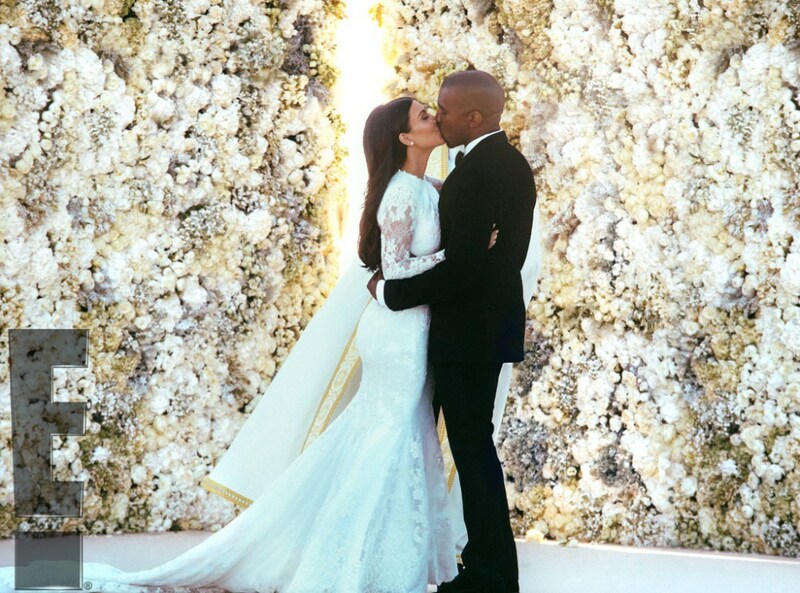 Kim’s ceremony had an amazing flower wall backdrop, I can’t imagine how good that must’ve smelled, but if you can’t spend $300,000+ on floral we’ve got a way to get the flower-wall look to wow the crowd and pop in the photos. 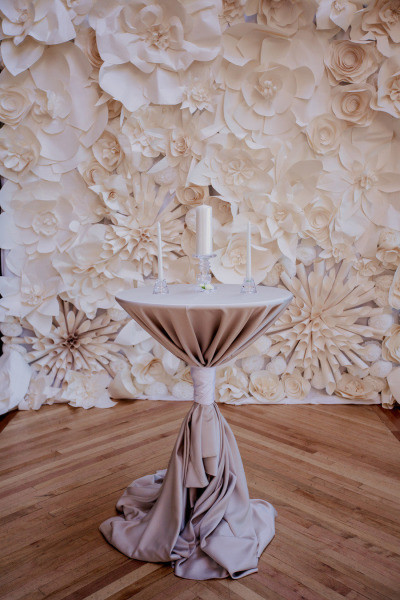 Have your friends or wedding coordinator help you build your very own flower wall out of paper flowers. This serves as a great back drop for the ceremony and would also be beautiful behind your cake. There are so many sources to use to figure out how to make your very own paper flowers. Below is a YouTube video that teaches you how to make your very own larger than life flowers, attach them to room dividers, or any other free-standing base that you’d like to use. 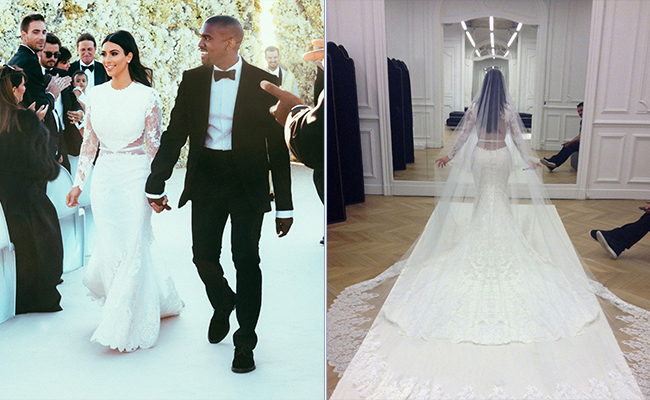 Kim’s trumpet gown had delicate lace details and a stunning back. Here are a few dresses that give off the flirty feminine vibe but at a much more affordable price! 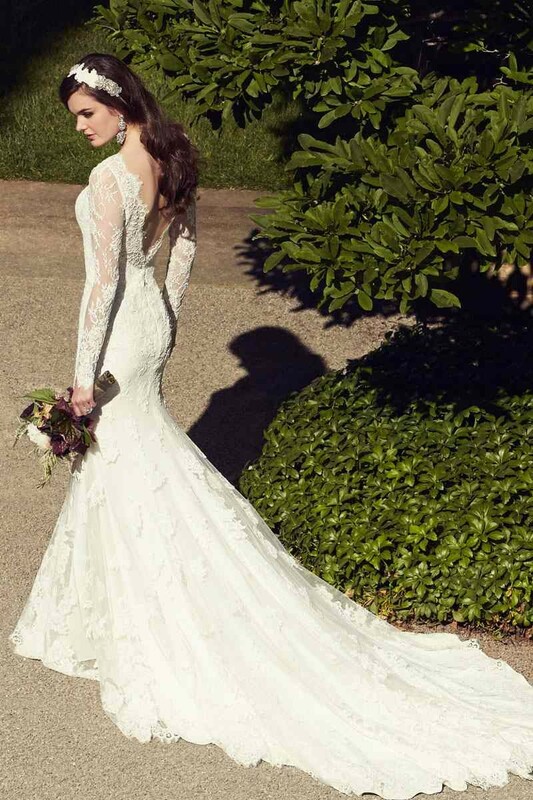 This beautiful gown mimics Kim’s dress with a trumpet silhouette, and detailed lace sleeves. The raw lace edged detail on the back would make for a stunning view for guests as you say “I Do” to your future husband. This gown is by Essence of Australia and is available at many local wedding gown retailers. 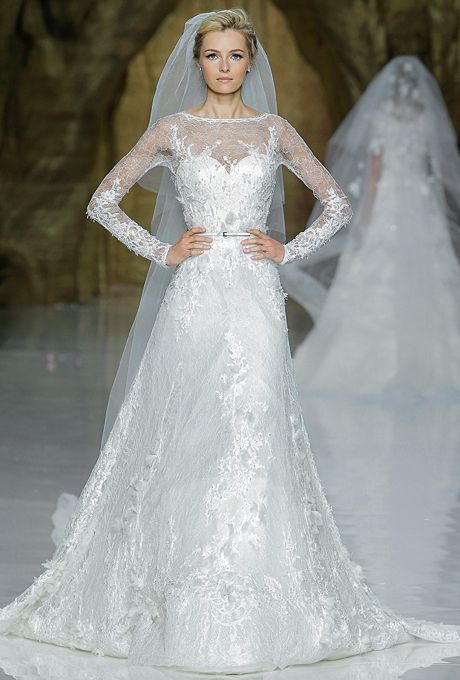 This gown made by Spanish designer, Pronovias, has all the feminine details a girl could hope for. The whimsical pattern and sheer illusion sleeves will be sure to wow the groom as you walk down the aisle. Pronovias gowns can be found at many local gown retailers. The cool color, white, is white-hot right now! This monochromatic color scheme, helps magnify all the detail you put into your decor and epitomizes class and romance. 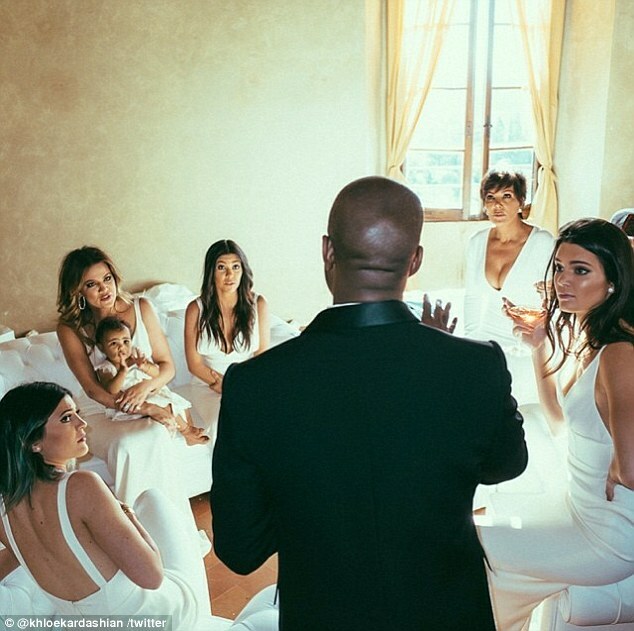 This celebrity couple put the bridal party in white, and you can too! 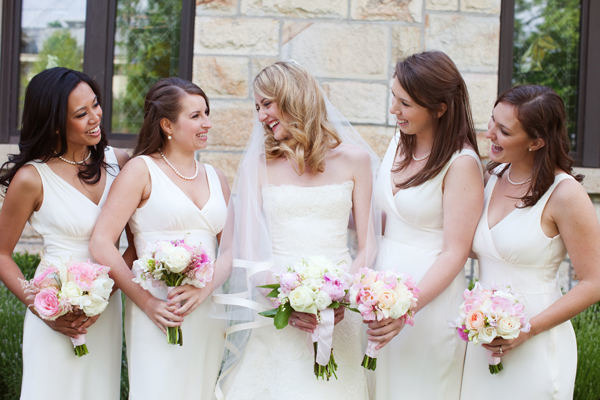 Most bridesmaids dresses are now being sold in white, creams, light champagnes, and ivory. If you’re worried about blending into to the rest of the bridal party, we suggest putting your girls in cocktail length dresses as a way to make sure you and your glamorous gown stand out. Although we weren’t able to get a hold of personal photos of the reception decor, it is rumored that the couple used long banquet tables to host their guests. By having your guests seated at long rectangular banquet tables you are able to create a huge visual impact. 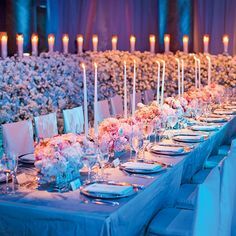 We suggest littering your table with small votive candles, pillar candles, and tall candle sticks. Candles will help cut down the cost, and give a warm romantic glow, then sparingly place small low lush centerpieces down the table. The couple commmemorated their special day by allowing guests to take home professional photos taken of them. 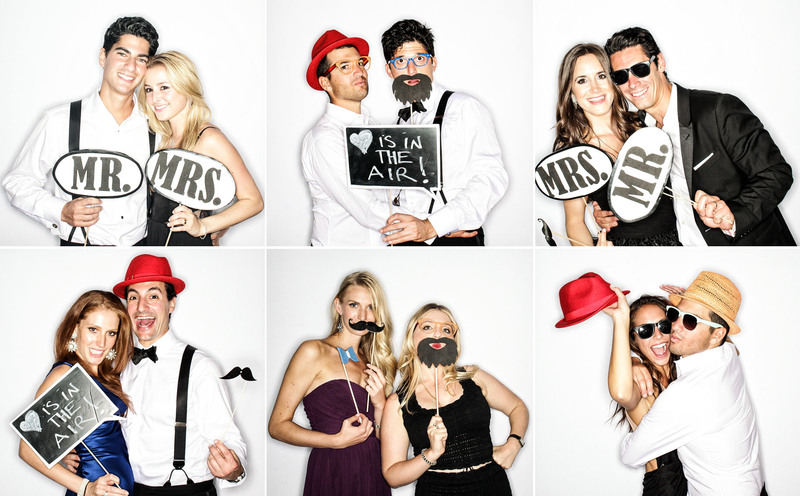 Although we don’t all have $20,000-$30,000 to spend on favors alone, a great favor is a DIY photo booth. Set up your camera on a tripod, and put a paper background and box of props up for pictures. You can also rent a photo-booth to be set up and used for the night complete with props for $500-1,500. Apologies to SocialLightPhoto.com for the incorrect tag on this photo. Another company was illegally using their photo and was credited by mistake. We always strive to credit the correct photographers and are sorry for this mistake. 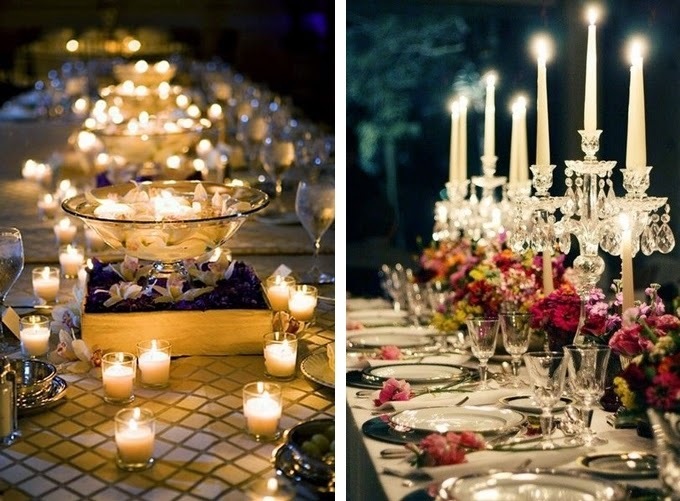 Stay on the look-out for more of Exceptional Event’s blogs on Luxe for Less! The image credited to absolutesphotobooth.com is a copyrighted image belonging to SocialLight Photos Aspen. Please correct. Please edit the picture that is credited to Absolutesphotobooth.com. That is a copyrighted image belonging to SocialLightPhoto.com that they were using illegally. So sorry for this mistake and crediting the wrong photo company. I have corrected the tag and the photo is now credited to you all, plus I added a note to the post. Thanks so much! Once it got out incorrectly, it has been quite interesting trying to correct the issue but we appreciate the updated note!